You have just registered with Afiliapub? We are offering an attractive bonus to each new Affiliate, so simply connect into your account to see your free 20 welcome dollars bonus which is waiting for you! 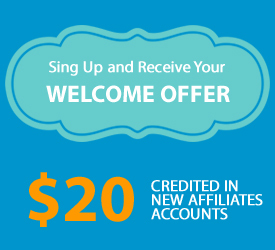 This welcome offer is exclusively reserved for any new affiliate who has successfully open an account with us. To withdraw this $20, the new affiliate would have to start promoting our campaigns and reach a minimum of $80 of commissions. Once reached, the affiliate would be able to cash out directly $100 of commissions (total commissions of $80 + the welcome bonus of $20).